Put another car on the barbie, or whatever they say in Australia. The opening guitar chords of Rancid’s “Fall Back Down” start pumping through the stereo as I take a corner at 100-plus miles per hour, tires squealing while my back end crashes through some scrub brush and kicks up red dirt. Fishtail successfully averted, my souped-up ‘69 Charger takes aim at a spot off in the distance, barely a blur against the horizon. I gun the engine, and by the time I fly off the cliff I’m pulling at least 160 miles per hour. There’s a gorgeous view of the Australian Outback as I plunge Icarus-like back towards the ground. Forza Horizon 3 sure is beautiful. 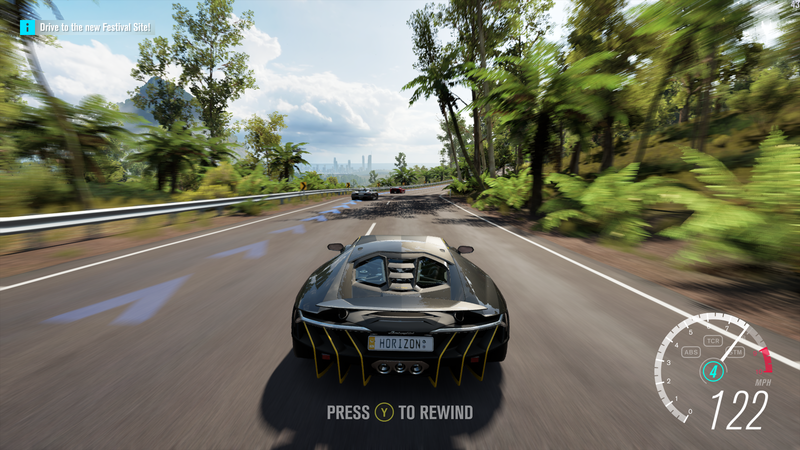 The good news is, of course, that Forza Horizon 3 is an actual, honest-to-goodness PC game, thanks to Microsoft’s Xbox Play Anywhere program. At least if you’re running Windows 10. We PC players get the definitive version of Forza Horizon 3, with 60 frames per second rates, 4K resolution, and better antialiasing and effects. And it’s truly a sight to see. This is the smoothest, the most realistic, that any of the Horizon games has ever looked. The sim-heavy Forza 6: Apex gets the edge graphically, and PC-first racers like Project CARS or Assetto Corsa look even better—but those are track racers. There’s a lot less going on. The Horizon series is different. It’s about street racing. It’s about exploring a massive open-world region—Australia, in this case. It’s pedal-to-the-floor-heart-in-your-chest-don’t-you-dare-touch-that-brake 250-plus miles per hour down an airport runway while “Also Sprach Zarathustra Op. 30” blasts in the background. 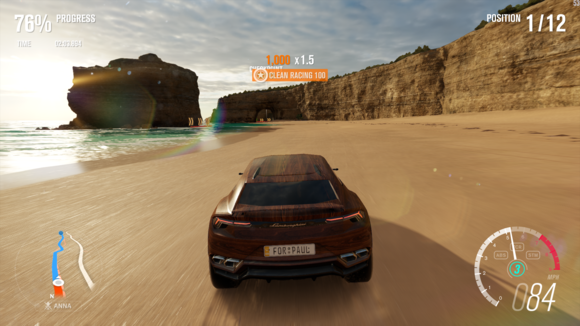 It’s about the joy of driving—not in the mechanical way that the mainline Forza games pursue, with an emphasis on tuning and parts-swapping, though those aspects are in Horizon if you want. No, Horizon is about the fantasy of driving, of a world where you not only own a Bugatti Veyron but are absolutely fine with driving it across sand dunes and through some farmer’s fields. The premise of Horizon 3 is that you’re now the boss of the globe-traveling Horizon Festival, a celebration of cars and music and more cars. As such, you travel to Australia to compete in races, set speed records, and gradually attract more fans to the show. More fans means you need more space, allowing you to open up an additional three festival sites and upgrade the existing grounds. These upgrades then, in turn, unlock more races and the cycle continues. It’s a slightly different story from the previous Horizon games, with you starting from the top instead of going zero-to-hero, but the outcome is the same: Lots of races, lots of driving, lots of first place podiums. The main difference is you now control what races are run. 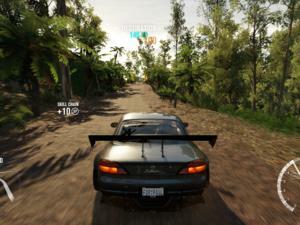 Don’t like the default event Horizon 3 tossed at you? You can create your own. Adjust the number of laps, adjust the class of cars that can participate—it’s all in your hands. A race in the Outback wants you to use dune buggies and you’re not interested? Sure, just make it a muscle car event, or only cars from the 1980s, or modern hypercars. It’s a much more freeform system than previous Horizon games, where you ran whatever it gave you. On the other hand it puts the onus on the player to experiment. There are more than 350 cars in Horizon 3, but this new hands-off approach makes it that much harder to bring yourself to give up an old favorite and try something weird. In previous games, you might encounter a race where you were forced to use that beat-up old van or whatever you had lying around in order to qualify. 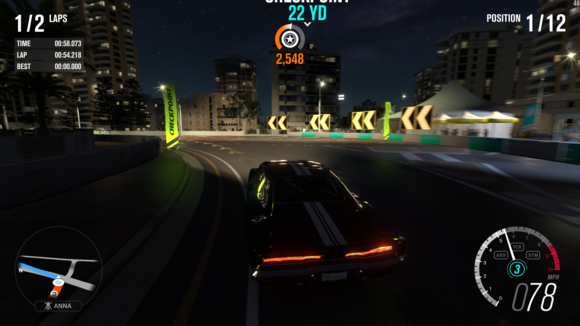 Here, I raced my standard ‘69 Charger, Lamborghini Murcielago, and the Veyron for most of the 25-odd hours I’ve played so far and I feel a bit guilty about it, like I should’ve explored the depths of Horizon 3’s car catalogue more. And for whatever reason, this freeform approach doesn’t apply to the myriad open-world activities in Horizon 3. 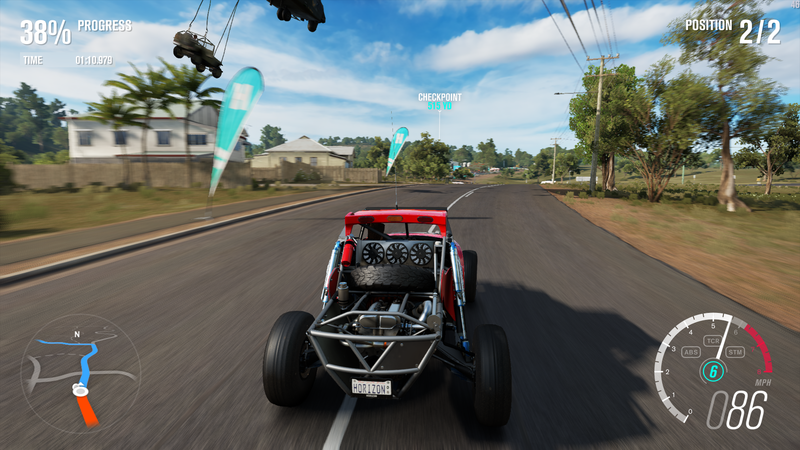 As with previous games, Australia is littered with Speed Traps (go as fast as possible through a set of speed cameras), Speed Zones (go as fast as possible down a section of road), and all-new Drift Zones (rack up drifting points in certain areas). They only show up after you upgrade your festival though, which is one annoyance. In previous games the open-world activities were just there from the start, but here it’ll take you hours to unlock the last one. Not only is it a hassle, but it makes the world feel a bit dead at the beginning. There’s simply no impetus to explore areas where the festival has no presence. My biggest issue though is that leaderboards for the open-world activities are car-agnostic. What this essentially means is you’ll only ever see three cars at the top of every single Speed Trap leaderboard—the Bugatti Veyron, the Hennessey Venom GT, and the Koenigsegg Agera. Far more interesting, and in keeping with the game’s approach to races, would be to see the fastest speed per car class, or even per car. How fast did someone manage to make their beat-up ‘53 Corvette go? Or the three-wheeled Reliant Supervan III? Another small annoyance: How big a grind the back half of the game becomes. You can roll credits within twenty hours, but attaining enough fans to unlock the last few festival tiers is a real effort. One I honestly wouldn’t bother with except, as I mentioned, the Speed Traps and Speed Zones and Drift Zones—my favorite part of the game—aren’t all available until you’re done. I don’t want to harp too much on what are small concerns, though. I’ve thoroughly enjoyed Horizon 3, playing it for hours at a time and barely noticing. Australia itself is perhaps the biggest upgrade of the game. I thought the leap from Colorado’s aspen-dotted mountains to the vineyard-ridden countryside of France and Italy was impressive in Horizon 2, but Horizon 3’s Australia is even better. Not only is it bigger, but there are so many different biomes and natural monuments to explore—from the dusty Outback to lush rainforests, from the quiet streets of Byron Bay to the skyscrapers of Surfers Paradise, from the Twelve Apostles on the eastern edge of the map to the Pink Lake on the west. The best parts of Horizon 3 come from just picking a spot on the map and driving, music pushed as loud as it’ll go. 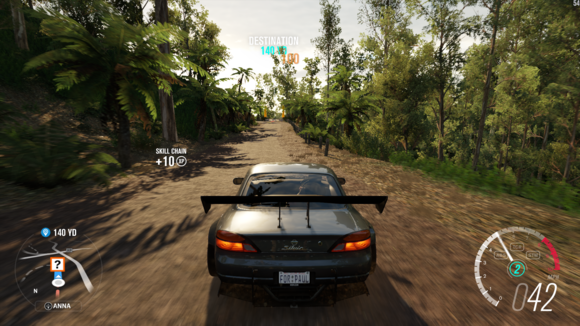 Before we wrap up, I just want to revisit Horizon 3’s performance and follow up on my impressions last week. I’m still experiencing minor stuttering at points, though it’s semi-random. The only consistent issue is races—the game doesn’t like twelve AI-controlled cars being on-screen at once. That's a bit of a problem, since races are the time you’re most likely to need a steady frame-rate. Personally I’ve just turned down some of the options for the moment. My 980 Ti is running the game at 1080p with a mix of High and Ultra settings, with 60+ frames per second most of the time and occasional dips to 50. It’s not perfect, but it’s workable. Regardless I don’t think it’s a huge deal—even with some settings dipped the game still looks better than the Xbox One version, so I’d still say this is the definitive version. If it really bothers you, locking the frame rate to 30 apparently “solves” the problem, though that’s a Pyrrhic victory at best. From what I’ve heard Microsoft is aware of the issue and is working on a fix. Hopefully it’s here soon. With Forza Horizon 3, the series continues its streak: This is the best arcade racer of the modern era. Best races, best cars, best music, best moments. I’m not a fan of a few aspects new to this iteration—the “You’re the boss!” story seems novel at first, but doesn’t really go anywhere and I think needlessly gates the open-world activities—but the core is still excellent and Australia is a joy. Start the countdown for Horizon 4, while we’re at it. The Forza Horizon series has long been the best arcade racer of the modern era, and this third iteration keeps that streak alive.